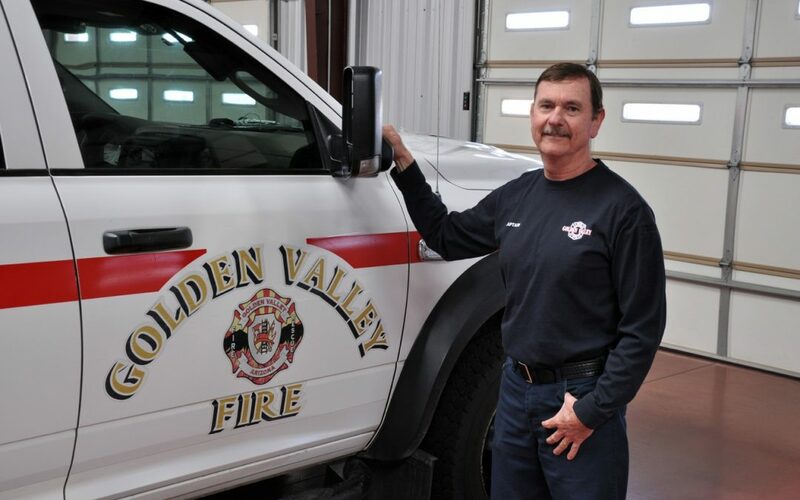 GOLDEN VALLEY – The Golden Valley Fire District Board of Directors has named GVFD Captain Dave Cunningham as the new interim fire chief and he will take over the helm of the fire district on April 1. Cunningham will be replacing Jack Yeager who held the position of interim fire chief for one and a half years prior to him resigning to take a job with the Kingman Fire Depratment. Yeager starts his new job with the Kingman Fire Department as the building and life safety inspector on April 2, 2018. Cunningham origionally became a volunteer firefighter with the Golden Valley Fire District during 1986 while he was a junior in high school. He continued to volunteer with the fire district for about a year prior to him graduating from high school and joining the U.S. Army in 1987. After serving in the military for four years, Cunningham got out after achieving the rank of Special 4 because he had a deep desire to go back and work in the fire service. Cunningham rejoined the volunteer ranks of GVFD in 1992 and attended the fire academy during 1993. After a two-year stint again as a volunteer, he was hired on as a full-time firefigther for the district and began his upward movement through the fire district ranks achieving the rank of engineer in 1999 and captain during 2003. Cunningham has taken numerous fire officer classes and has a two-year fire science degree and a two-year paramedic degree. “I look forward to working with the GVFD board of directors and the community,” Cunningham said.